I had a chance to walk through a small privately owned nature preserve this week. More pictures another day! And it's public, so I'll be going back. Today, I'm just going to share one thing, a new-to-me dragonfly. That's not saying much. I'm no expert. But you know I love new things. 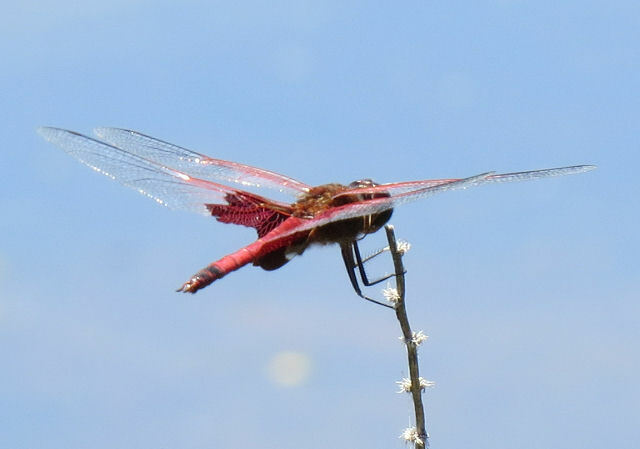 This is the Carolina Saddlebags dragonfly, male. 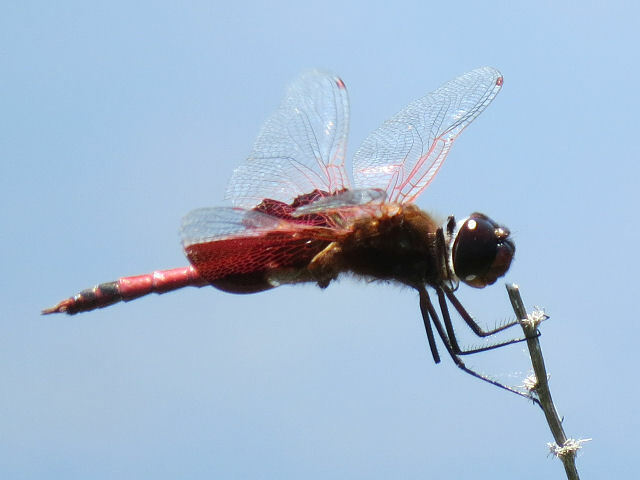 There is also a Red Saddlebags, but its red patch does not go all the way to the bottom of the hind wing like this one does. I'm really pleased to get these pictures. In other news: boiled and strained mulberries in preparation for making something, worked at Shagway, wrote some (but it's not very good- too hot for functional brain), and melted even more in the heat. I've had the computer running for a few hours now. Did critical things like writing and combining the parts I've written with various technologies (some pencil and paper) into a cohesive narrative. So, in case it craps out again, I've done the priority things, so will try a blog post. 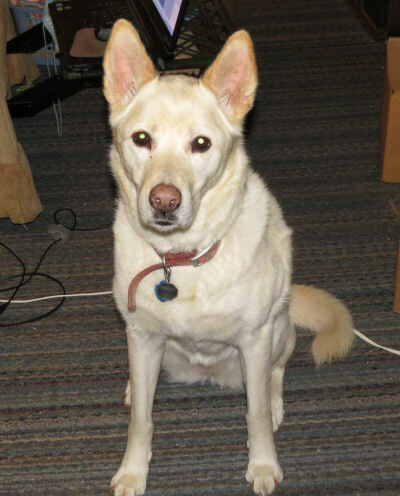 Ester's sweet dog, Jade crossed the rainbow bridge on Wednesday. We had some good times together. They helped spot me for a number of hikes. 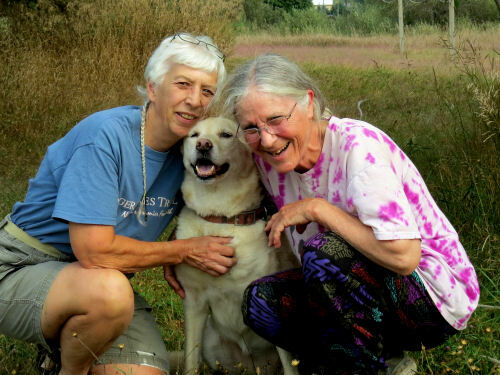 This picture was taken soon after she came to live with Ester. Jade stayed with me off and on a few times. 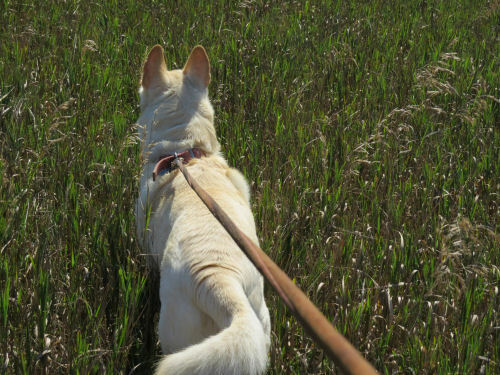 She wasn't big on walks, but we went outside at least. 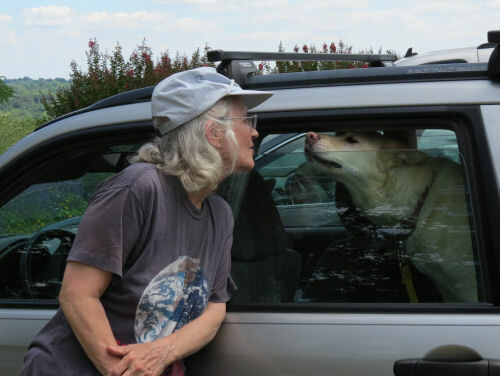 She was not intent on being an alpha dog- she just wanted to be friends. In other news: errands, car fix, computer fix (maybe), worked at Shagway, melted in the heat. Got home from Ester's today. 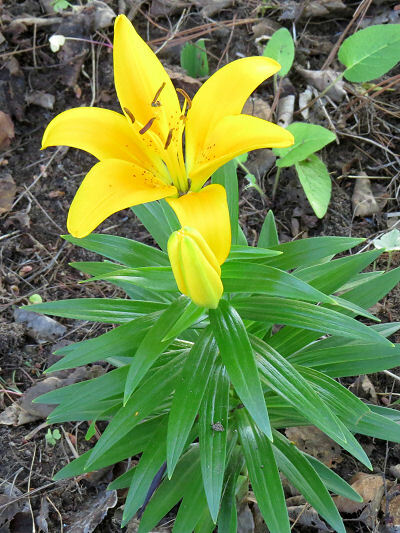 Discovered a yellow lily in my flower garden, when I arrived! This is an oriental lily, not a day lily. I have no idea how it got there- must have been the garden fairy that brought it! 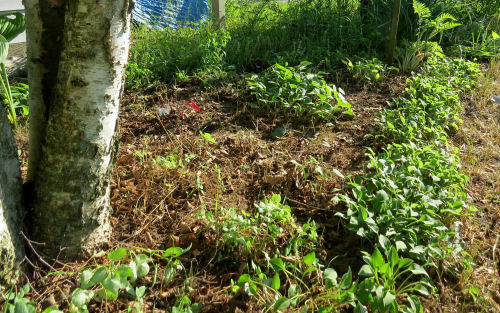 I don't plant this kind because they are mole candy. There's no point. But look at this. The mole got lazy. So for this year at least, I get to enjoy something. 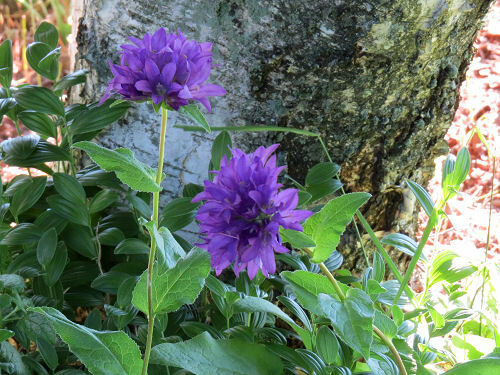 And the purple globe bellflower, Campanula glomerata, (the purple one may be variety 'Superba') is looking great. 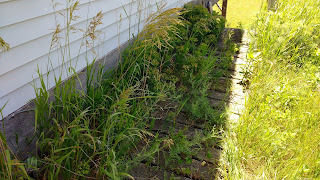 I have quite a few white ones which have spread. They are only in bud. I thought I had shared their picture before, but can't find it. Anyway... the purple one is kind of spectacular. And the garden liar? Must be me. I said I wasn't going to garden any more, but the yellow lily and some hosta sprouts from Ester made me spend some time this afternoon. And I enjoyed it. Maybe what I should say is that if I don't garden, I won't feel guilty. OK, so it doesn't look like much from this angle. But you can see that I've pulled a bunch of weeds, anyway. In other news: I drove home from Ester's (maybe a tribute to Jade tomorrow), picked up my computer, did a couple more errands, unpacked, and am trying to catch up on some computer things. I'm trying to blog from my phone. Experimental to say the least. Computer gave an electrical SNAP and blacked out. It's gone to computer hospital but I think it's a goner. Thank goodness I m pretty sure everything important is backed up. 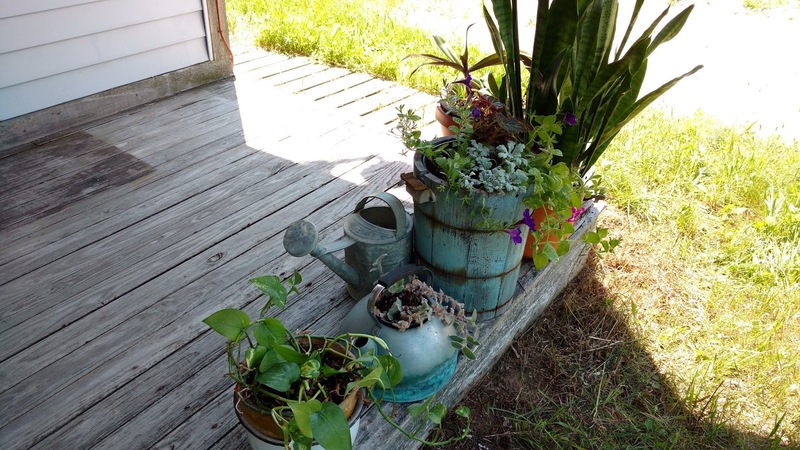 Moved some houseplants outside to keep the flowers company. There are a couple more interesting things from Dow Gardens, but I think it's time to return home for a while. First of all, let's have a show of hands from all those who thought I could refrain from playing with plants at home entirely. Yeah, I don't see any. It's like this. 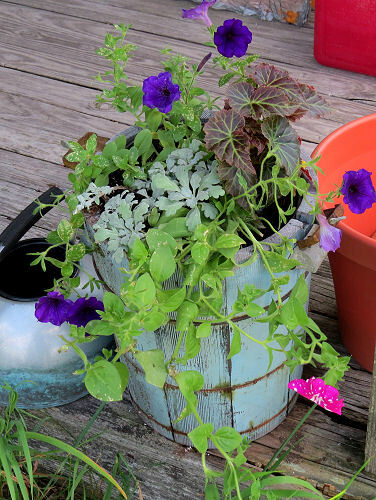 The garden stores have now marked bedding plants down to 50%. So I came home with all these for only $6. I'll keep you posted on how it looks in a few weeks. This makes me smile every time I walk out the door. Yesterday on my walk I watched some redtail hawks circling. 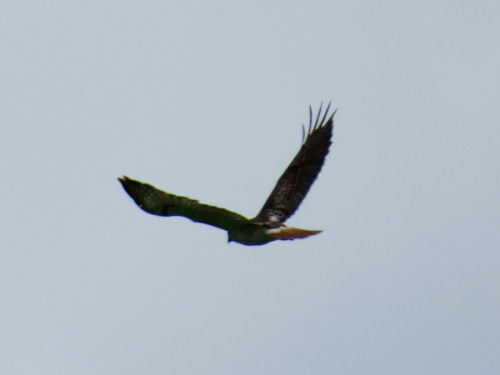 They soar with wings flat, but this one was actively flying. Just luck I caught this picture. Today, I drove to take a hike on the North Country Trail. Did six miles. 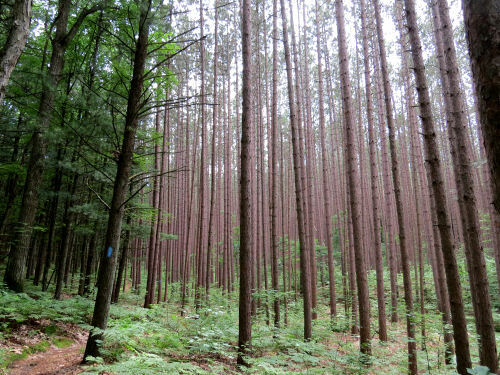 The red pine plantation is always a magical place of light. 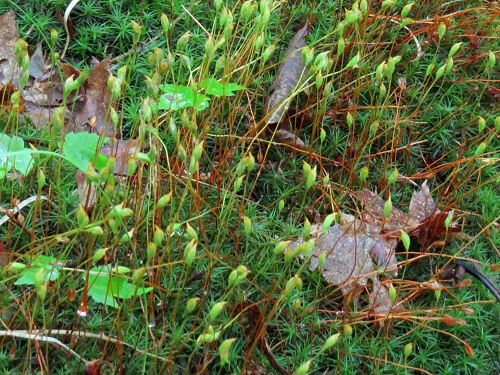 Looking down, there was a forest of moss sporangia just as dense as the pines on a smaller scale. 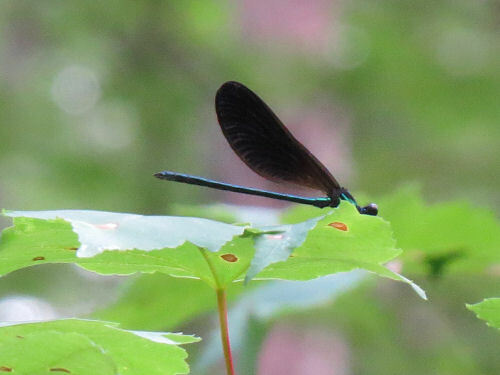 A male Ebony Jewelwing damselfly was playing hide and seek. 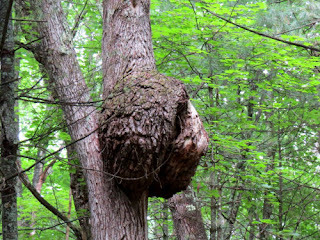 Of course, I see this huge burl every time I walk this section, but today I took its picture. It seemed as if it might rain, so I hurried back. No rain, but the humidity was high and I was soaked with sweat, so hopped in the shower. 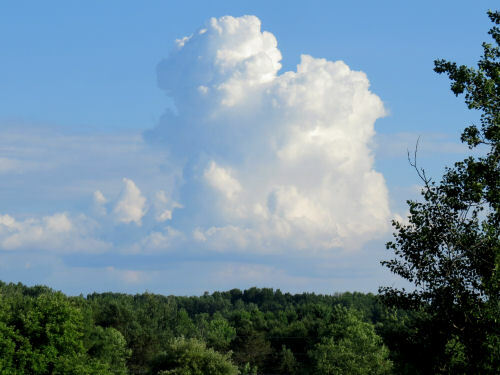 The sky has now cleared and lovely cumulus clouds are building across my back yard. 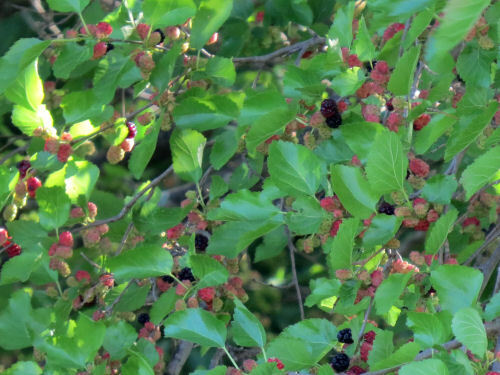 The mulberry tree is really loaded this year. Even though most aren't ripe yet, the birds are already going nuts! I'm going to try to capture some for myself. Maybe tomorrow. Certainly this week. In other news: I wrote a chapter in The Bigg Boss. I lamented over the fact that I accidentally overwrote all the edits I did the other day. 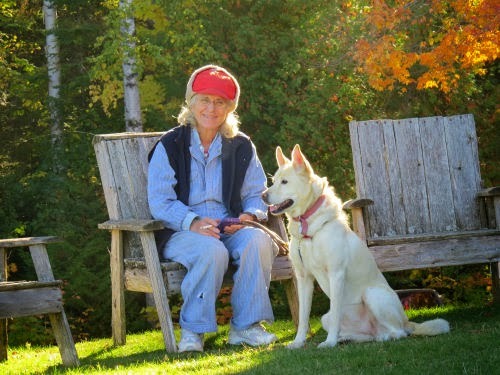 I walked six miles on the North Country Trail (Hike 100 Challenge is at 34 miles). That doesn't seem like much, but it took all the time. Plants will just surprise you over and over. There are so many variations! 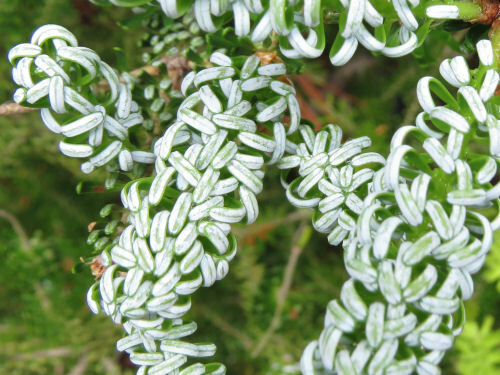 These are all leaves, or the coniferous variation called needles. I love how you can just study the patterns and designs. This one was completely new to me. It's Korean fir, Abies koreana, variety 'Horstman's Silberlocke.' The needles recurve so you can see the white underside. It was stunning. I looked it up and read that it also has large blue-purple erect cones in season. 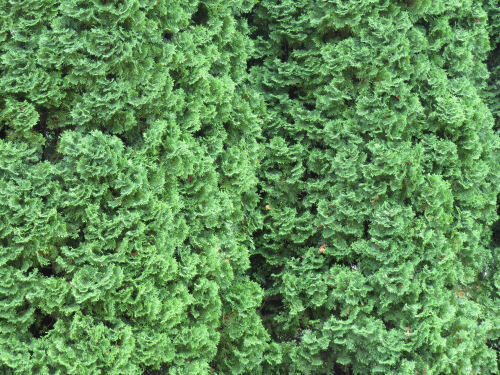 I don't know how you can go wrong if you want an ornamental conifer. I gravitate toward dark plants. 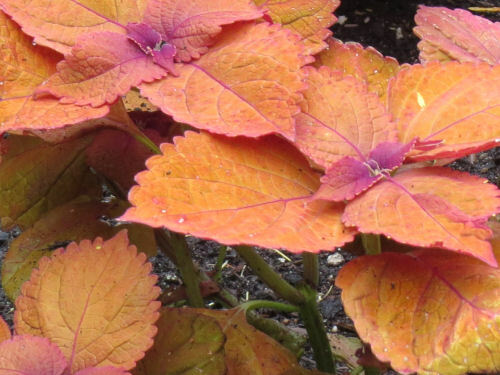 This is another version of coleus. I think the varieties are endless. They had a whole bed of this one with a white flowering plant around the edges. 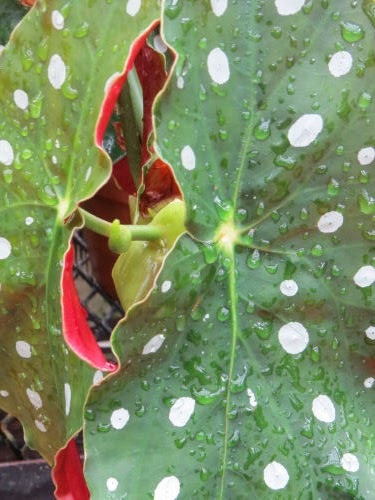 Finally, here's a spotted angel wing Begonia, Begonia carollina, possibly the variety 'Cecile.' My mother used to have one of these that got huge! In other news: I did laundry, wrote a chapter, took a walk and tried roasted cauliflower. Let me just say that it was good, but I won't feel the need to do it again. An oily bowl, followed by an oily oven pan, and a lot of chopping. I'm happy enough to just eat the cauliflower raw. 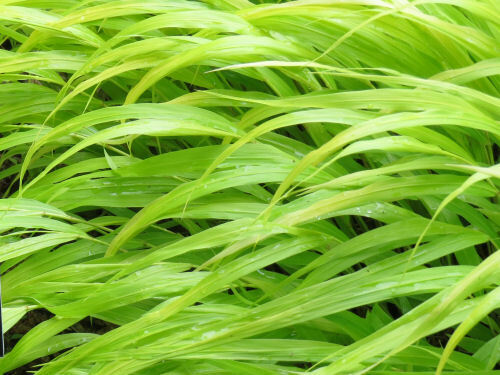 This is a Japanese Forest Grass, Hakonechloa macra, variety 'All Gold.' 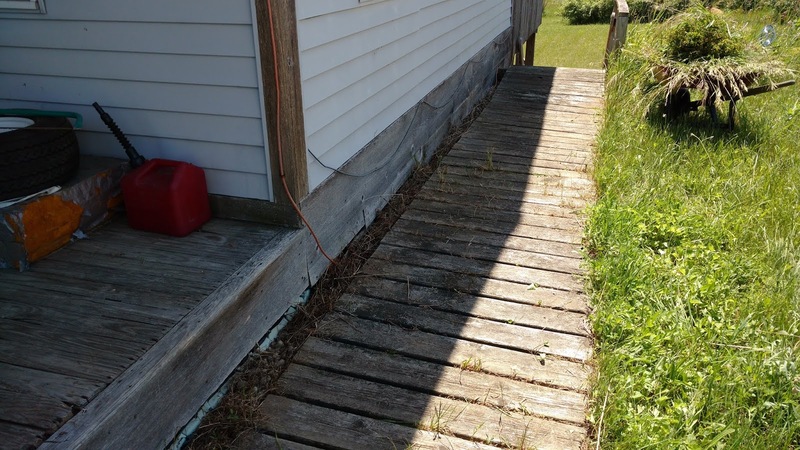 I'll bet in a slight breeze this just flows like water. Begonias always catch my eye. 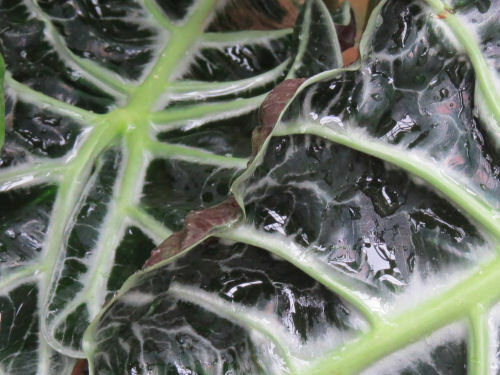 There are SO many varieties and colors and leaf shapes. I have no idea what this one is. It was in their small conservatory. Almost nothing in there was labeled. 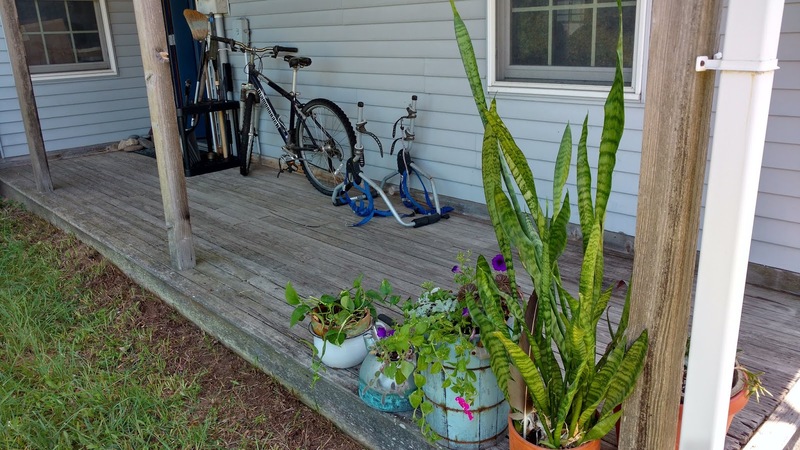 It was more like just a storage space for plants that aren't hardy. But the texture of this one is fantastic. Finally, this is not anything rare at all, except it was in bloom. 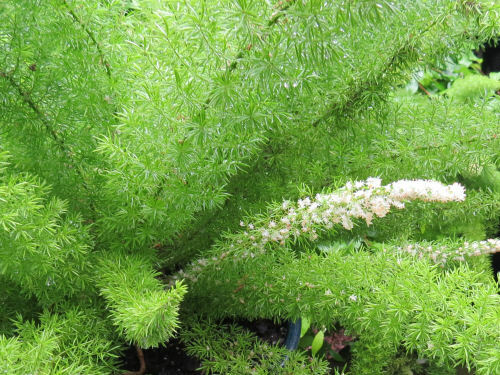 It's a foxtail asparagus fern, Asparagus densiflorus 'Myersii'. These began showing up in city planters a few years ago, and they are definitely a worthy addition to streetscapes. I'm beginning to find some other things I might want to put in the blog, but there is still so much good stuff from Dow Gardens. I guess you'll have to come back to see what I pick next. In other news: I spent the morning editing The Bigg Boss (15 chapters done), and then went out to distribute flyers and posters for our author event in the afternoon. Not my favorite activity by a long shot, but I got it done. There are so many beautiful individual plants I could show you! Dow Gardens is like a big flower show... the good stuff just keeps coming. But I can't move away from it just yet. Today I'll show you some of my favorite pictures that exemplify COLOR. 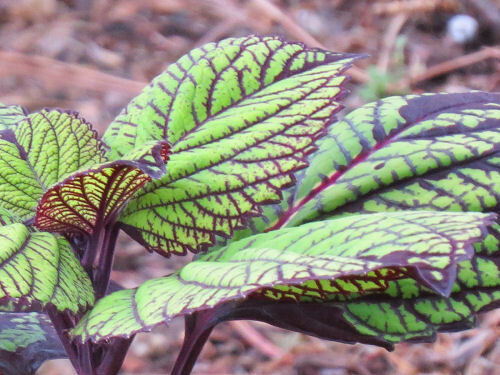 It's no surprise that several of them are coleus (now broken into two genera, so I didn't capitalize it). 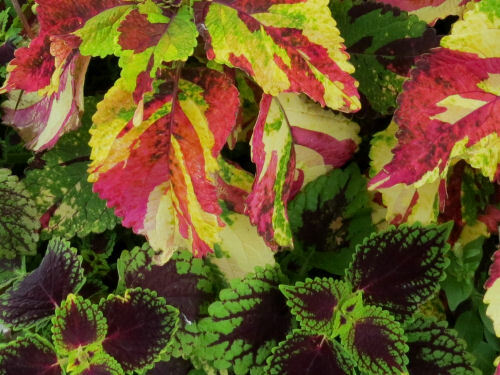 We probably all know coleus... it's that great planter specimen that features beautifully variegated leaves. They are a relative of mint, but without the minty smell. 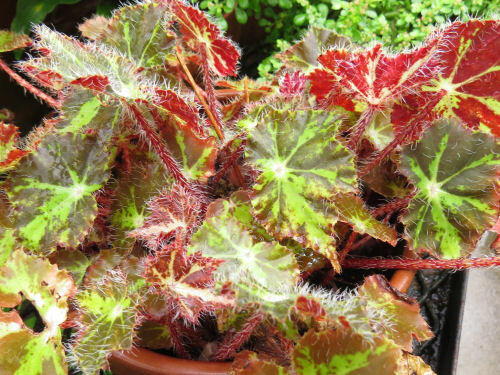 They are great for showy gardens because if you pinch off the blossoms, the gorgeous leaves just keep their beauty all season long. How about the 'stripe-me-pink' oyster plant? This is a variety of my Moses-in-a-boat with colored leaves. 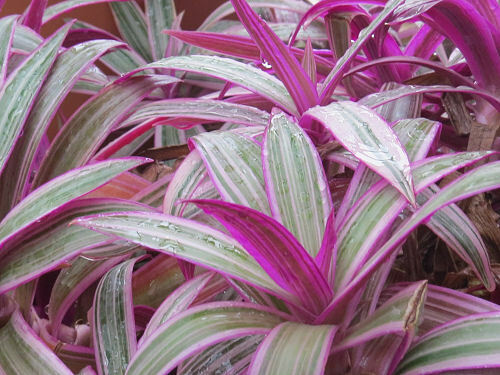 Technically Rhoeo discolor or Tradescantia discolor (names are changing faster than one can keep up). 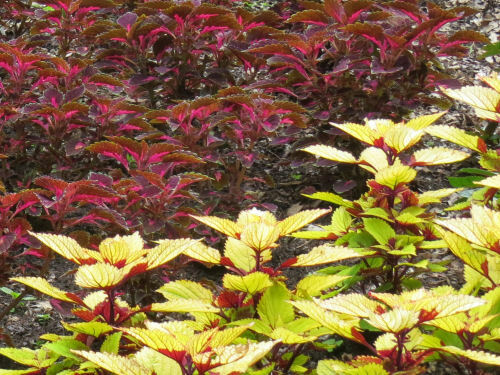 Back to coleus for an interesting salmon color variety. I debated whether to show you this one under "color" or hold it for "design," but you get it today. 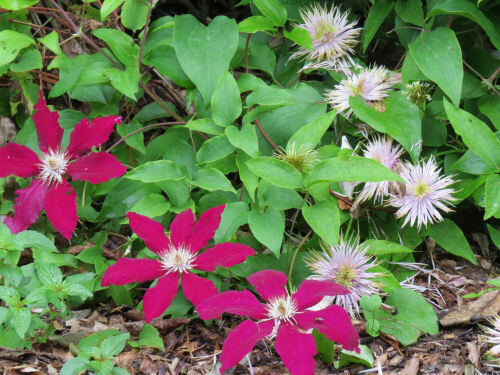 This is some variety of Clematis. Finally, we're back to another display of coleus. This one is in the colors I was trying to pair in my own flower garden, maroon and yellow. So I particularly like this. In other news: My writing workshop ended today. Great stuff! I'll be doing a post about it on the other blog.